Mrs. Carpenter Suffers Stroke of Apoplexy with Fatal Result. Lovett, July 14. 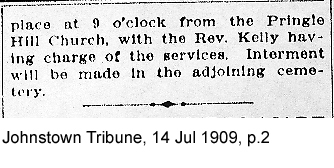 - Mrs. Catherine Pringle Carpenter, wife of Henry Carpenter, died at 5:20 last evening at her home in this place following an attack of apoplexy. She became ill yesterday morning. The deceased was seventy-nine ears [sic] of age and is survived by her husband and the following children: Jesse and William, of this place; Mrs. Oliver Plummer, of Beaverdale; Mrs. David Ream, of Pittsburg; Mrs. Alice Croyle, of West Danville, and Miss Sue Carpenter, at home. 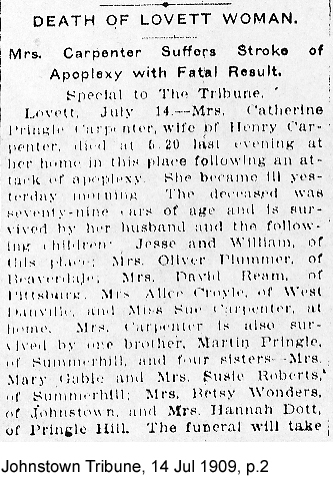 Mrs. Carpenter is also survived by one brother, Martin Pringle, of Summerhill, and four sisters - Mrs. Mary Gable and Mrs. Susie Roberts, of Summerhill; Mrs. Betsy Wonders, of Johnstown, and Mrs. Hannah Dott [sic - Dopp], of Pringle Hill. The funeral will take place at 9 o'clock from the Pringle Hill Church, with the Rev. Kelly having charge of the services. Interment will be made in the adjoining cemetery.